Snapstream, a startup that makes a device that lets enterprises record thousands of hours of TV (from both satellite and digital cable sources) and search inside the recordings for keywords, recently launched a trending topics site for TV. 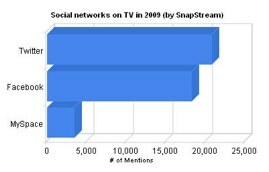 Snapstream has released its top trends on TV for 2009, with the mention of “Twitter” used more often than Facebook, MySpace and other social media platforms. .
TV programs used the word “Twitter” in their programming three times more often in December 2009 than they did in late 2008 and January 2009, according to the data. SnapStream also released the top keyword mentions on TV, which are in order: Iran, Michael Jackson, Swine Flu, North Korea, AIG, Pirates, Hamas, (The) Inauguration, Ted Kennedy, and Balloon (boy). SnapStream also revealed that mentions of “health care” eclipsed mentions of “economy” towards the end of the year thanks to President Obama’s healthcare initiative. SnapStream’s trending topics site lets you see the hot words (those that are ascending in mentions) and cold words (those that are descending in mentions) on national television. And you can also enter couple of keywords (up to 5) into TV Trends and you’ll get a graph showing you the relative frequency of mentions of those words on mostly-news national programs on ABC, CBS, NBC, FOX, MSNBC and CNN. Snapstream crawls closed-captioning text for programs that they record. They filter out local programming, sitcoms, and sports and then cleans-up, analyzes and indexes data for the trends site. When you graph a keyword, the site will give you a view of excerpts of stories at selected points along the curve and you can also filter the results by network. For example, you can chart trends of the mention of “Twitter” on CNN alone. As we’ve written in the past, SnapStream’s site isn’t updated in real-time (it is updated every 3-4 hours), which puts its topics at a disadvantage to Twitter and Google’s topics, that are close to real-time. But many of SnapStream’s top mentions did match Twitter’s top trending topics.